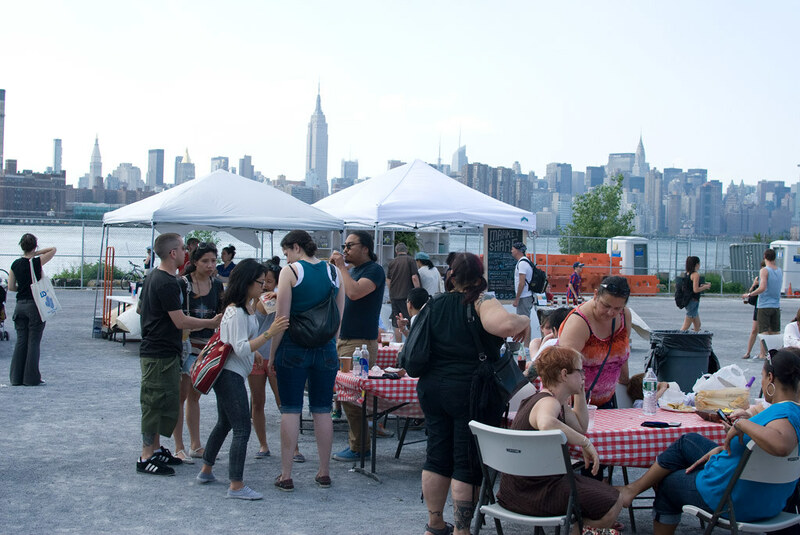 Smorgasburg, the food vendor spinoff of the Brooklyn Flea, has gotten more press than just about any other food-centric event this summer. A lot of attention has been paid to the lobster rolls, the friend anchovies, and the raw oysters. There’s also a lot of vegetarian food to be found, though to be honest it’s not great. I was excited to try Barry’s Organic, locally made tempeh, even though I’m not a huge fan of tempeh. 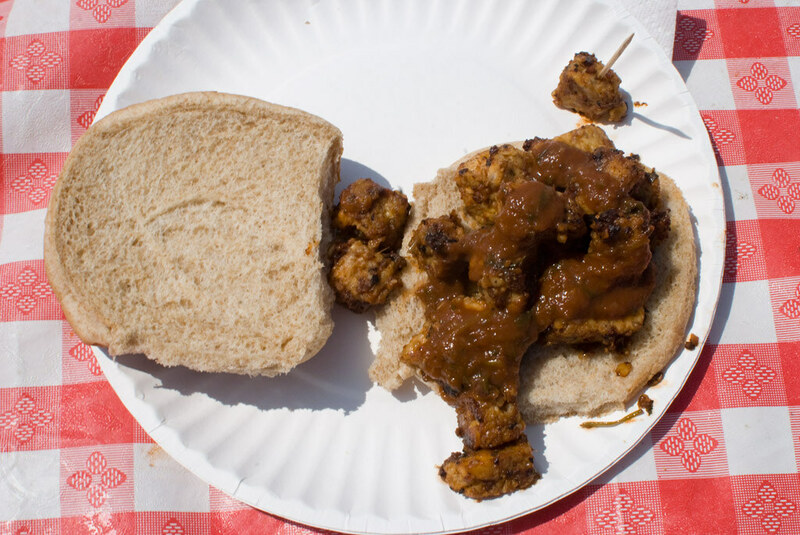 For $6 I got the BBQ tempeh sandwich, a messy, overly sweet and mushy thing. I was also intrigued by the $8 spring vegetable salad from Tenpenny; a mix of vegetables like roasted sunchokes, blanched peas, beans, and raw grape tomatoes, all tossed with their homemade ranch dressing and topped with toasted chicory. This was good, but it never felt like more than the sum of its parts — it was a bit of a disappointment. 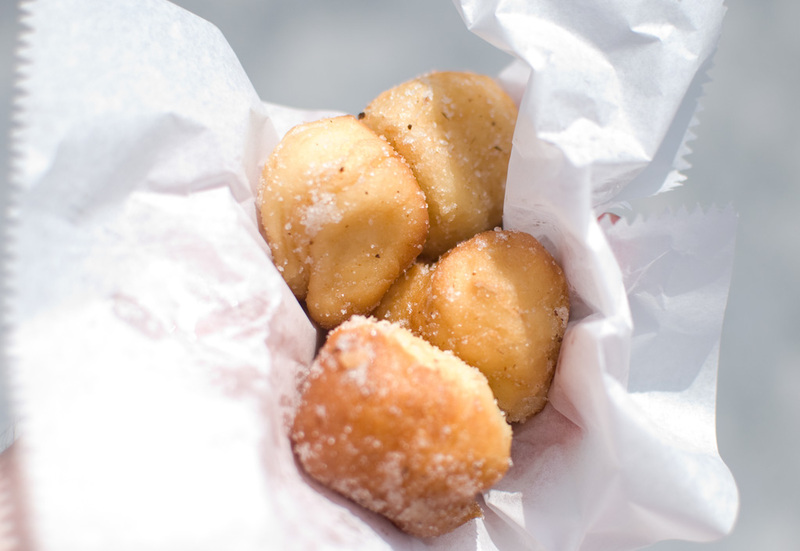 My favorite donut place, Dough, had a booth there, and I got the donut holes (4 for $1). The donut holes, tossed with cinnamon and sugar, are just as light and airy as the donuts and made a great snack. I also got a great smoothie from Salud, made with soy milk, agave nectar, strawberries, mango, and coconut flakes. It was refreshing and delicious, despite being so healthy, and was the perfect antidote for the heat of the day. There’s a lot to like about Smorgasburg — the view can’t be beat, and the sheer breadth of choices is astounding. I wish that the vegetarian options were a little better, but I’ll be back to try some of the other things. Any recommendations? This entry was posted in williamsburg and tagged smorgasburg, williamsburg. Bookmark the permalink. I went yesterday and had some fine pupusas with a sloppy load of toppings. 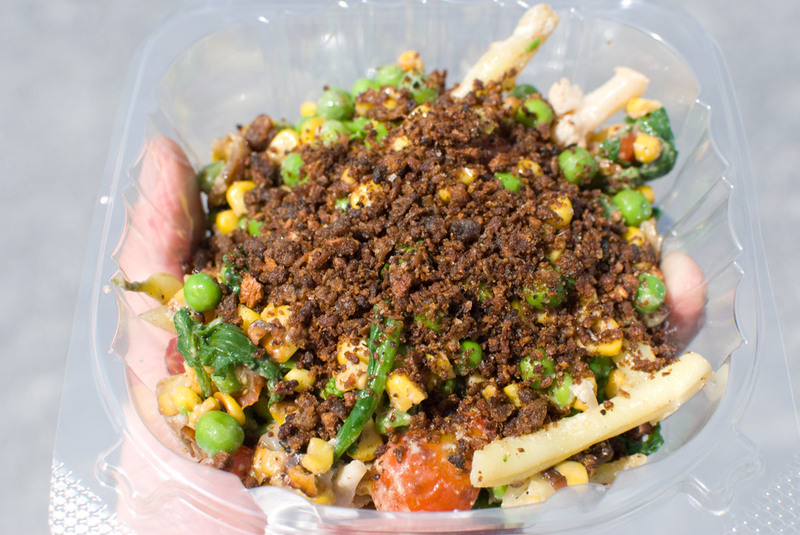 You can choose from a variety of veggie fillings like spinach and loroco. I wrote about them on my blog (linked above), but I have to apologize for forgetting to take a picture of them before I wolfed them down. 🙂 I did, however, snap a pic of their menu. Those donut holes look mighty snackable. I didn’t see Dough there yesterday. Maybe they ran out by the time I got there (around 3 pm). Thanks from the guys at Grown In Brooklyn for the BARRY’S TEMPEH mention, enjoy! Great post. I go back for the organic smoothies from Salud and the doughnuts from Dough! Such an amazing market. I love Smorgasburg! @BrooklynKnight – thanks! i really enjoyed the smoothie from salud, i may make the trip out to midwood to get it straight from the source.